Valves are clavate and triundulate. The headpole is narrow and rostrate to subcapitate. The footpole is subrostrate. Valves are widest at the center valve. The undulation nearest the head pole is coequal with, or narrower than, the central undulation. The undulation near the foot pole is narrower than the undulation near the head pole, giving the valve a wedge-shaped appearance. The axial area is narrow. The central area is an incomplete rectangular fascia, interrupted on one side by a shorter stria with an isolated stigma, and on the other side by 0-2 shorter striae. The raphe is lateral, becoming filiform near the proximal and terminal ends. Proximal raphe ends are straight and terminate in slightly inflated ends. Terminal raphe fissures are deflected to the same side at approximately 45 degrees. Striae are curved and nearly parallel near the central area and become radiate and straight near the apices. 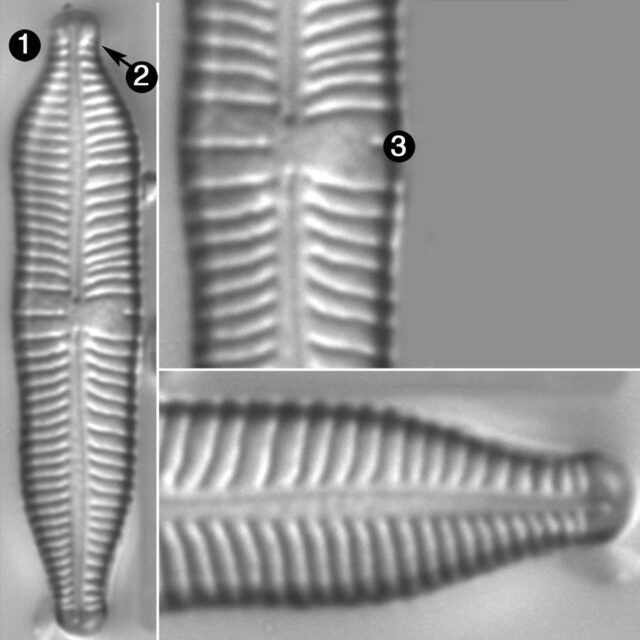 Areolae in the striae are fine and are greater than 30 in 10 µm. This taxon was described from material collected in Spitsbergen, Norway. 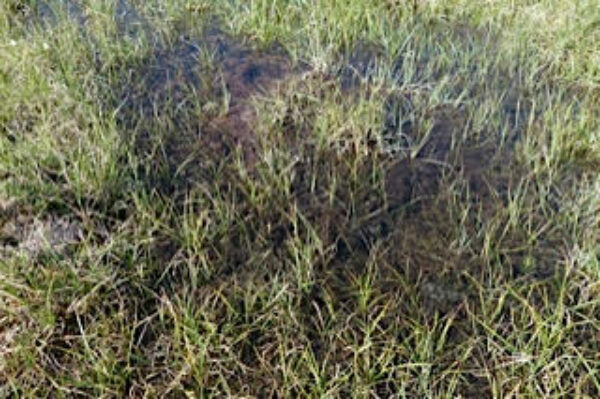 The specimens shown on this web page were collected from a small pool on the tundra of Nunavut (Canada) above the Arctic Circle (photo below). The pH of this pool at the time of collection was 8.10. Foged, N. (1964) Freshwater diatoms from Spitsbergen. Tromsö Museums Skrifter 11: 1-205. Valves are clavate and triundulate. The headpole is narrow, and rostrate to subcapitate. Valves are greater than 8 µm wide.